You and your team haven’t slept for weeks. You’ve worked so hard to develop and polish your app till it shines. Here it is – crisp and clean, ready to be uploaded to AppStore or PlayMarket. Is it the time for you to relax and enjoy the deluge of downloads? 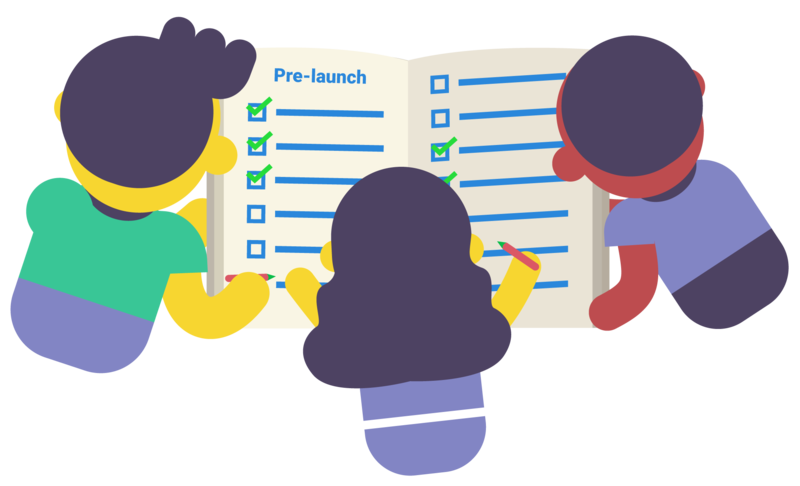 It’s just about time to find people who will be the first to test your app. Personally, I like “early adopters” better. Honestly, I had little experience dealing with beta testers before. However, it’s the challenge you face inevitably once you join a tech startup. 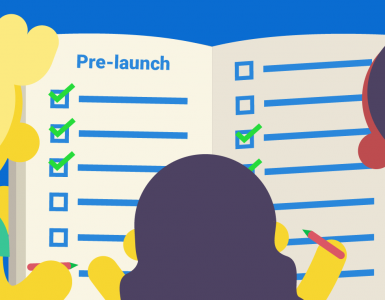 We discussed it during one of the meetings — what do we do when the first app version is ready? Obviously, we need some feedback to know how we are doing. We’d then consider it, fix all the bugs, and proceed to a public beta. Are we moving in the right direction with our app? Does the app solve the issues our customer have? Our early adopters were supposed to answer these questions. How We Got 100 Free Beta Testers Without a Product or Landing Page Ready Yet. We had a very vague idea of where and how to find volunteers interested in testing out our app. “Wow, the first 100?,” I thought. “Alright, let’s have 100 by the end of the month”. What’s different (and what I personally like) about a startup is that you constantly challenge yourself with things you’ve never done before. This is how you try, make mistakes, fail, learn a lesson, get up and try again. You’ll never know until you try, they say. 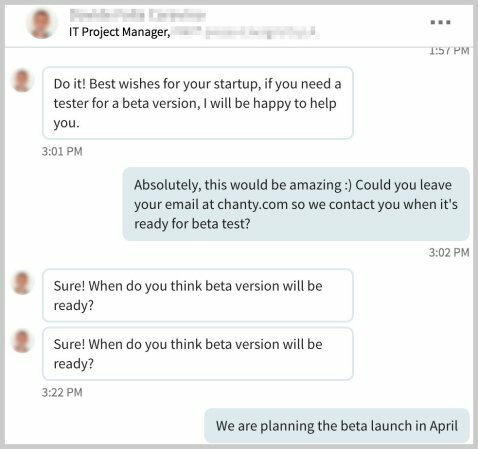 Submit your startup on beta platforms like betalist.com, betabound.com, betafamily.com, etc. Post on Reddit. The guys from Blue Label Labs got their first 1,000 users from Reddit and wrote an article about it. If your product is B2C this tactics should work particularly well. Engage sites with paid services like killerstartups.com ($167), earlibird.com (from $500) etc. Thorough research showed that there are quite a few resources offering beta tester services out there. Nevertheless, we decided to concentrate on the top platforms, as we believe the 80/20 rule comes in pay when searching for beta testers. The top 10 beta websites may bring you 80 percent of your beta users while the rest would result in the remaining 20 percent. Our startup is working without any side investors, so our budget is quite limited. We consider paid services last and only if we have no luck with free resources as a way to maximize our beta testing marketing budget. We are totally aiming to submit our product to the beta platforms listed above when our marketing landing page is ready. And we’ll be sharing our experiences with you in future blog posts so you can see how our beta testing is progressing. Update (November 2017): After submitting Chanty to multiple beta testing platforms, it turned out Beta list brought more signups than other platforms altogether. However, the number wasn’t that impressive. Unfortunately, we didn’t even hit the 100 emails. As i said, it’s still better than other services, so if I were to do it again, I wouldn’t be spending time to submit Chanty to other platforms that brought us only 1-5 emails. It was obviously too early to submit our startup anywhere, and I knew the design of a new landing page wouldn’t be ready until next week. So we had to think of another way to get these 100 by the end of the month, and we came across an interesting strategy by a complete surprise. Getting to know your target audience is extremely important for every business. If you are a business owner you’ve probably experienced this first hand. At the moment we didn’t know much about ours, but I’ve learned through previous online marketing experience that a clear view of your target market is a must — unless you want to fail at the very beginning. Of course we didn’t want to fail, so we had to study our market. We’ve put together a Google form with a few question . It helped us understand our target market better. Who is more likely to initiate using a team messenger in a company? How big is a company where people use a team messenger? Which team messenger features are the most popular among the users? What is the industry where team messengers are most widely used? 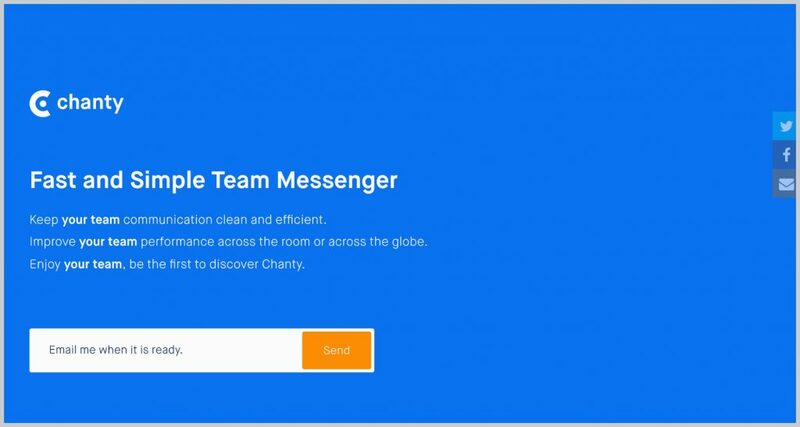 What kind of companies are actually paying to use team messengers? Being a startup targeting SMB’s, we have decided to focus on LinkedIn as a source of information. Obviously we had to send out a lot of invitations. 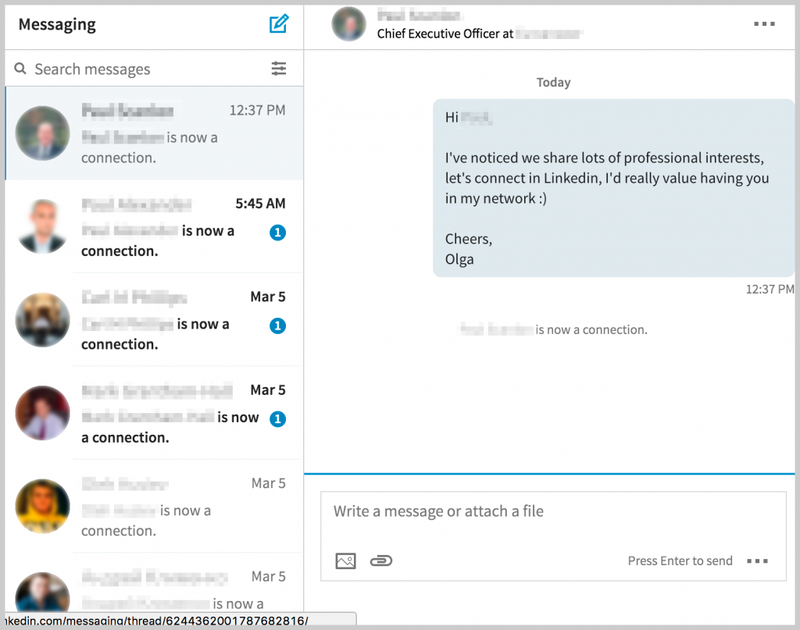 LinkedIn Premium lets you send out as many invitations as you physically can fit into your day. Be careful, however, if very few people accept them, LinkedIn may treat this as spamming and ban you. Anyway, 20 percent of the people I’ve reached out to in LinkedIn didn’t mind connecting and joined my network. Tip: It’s important to add a short personal note with a name of the person you are trying to connect with when sending a LinkedIn invitation. Even though it takes more time to send personal notes than just hitting the “Send now” button, it significantly (30 percent) increased the response rate in our case. 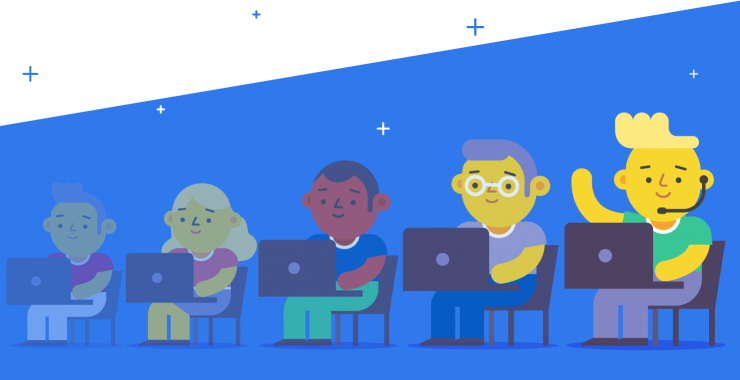 We needed to target people who are more likely to initiate using a team messenger in a company. When the first survey results arrived we realized CEOs and top management are the people we are looking for. My next step was writing a friendly message, thanking the contacts for adding me on LinkedIn and asking for a small favor. I explained that we were researching the market of team messengers and asked for a permission to send a 3-minute survey. Tip: Speaking of permissions — it’s important to ask if you can send the link before you actually send it. I’ve asked for it intuitively but later on I’ve read about this same effective practice in Groove’s article. 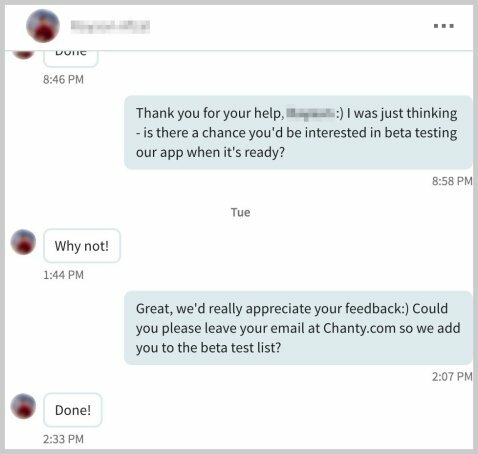 Even though we had a direct link to chanty.com in the end of our survey and a CTA to “email me when it’s ready,” we didn’t expect to receive beta testers yet. This guy was actually interested in becoming a beta tester, and then I thought, hey, we can actually get people to sign up as beta testers as well. Our marketing team shifted focus to LinkedIn for a while. 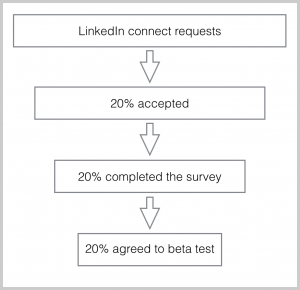 To give you a better idea of the numbers, contacting 125 people on LinkedIn resulted in 1 beta tester. We had to contact more than 10K users to receive 100 emails. Checklist: 50 Tips for Your Startup"
Update (November 2017): LinkedIn strategy was a great way to start and switch from 0 to 1. Now when we are far more experienced in finding beta testers, content marketing helps us generate leads. Check out the article I’ve written for SemRush for a step-by-step lead generation strategy we use these days. Besides adding new contacts, I’ve also messaged all of my existing ones. My established LinkedIn connections naturally resulted in a much higher conversion rate. This may seem like a lot of work and lot of time spent. The four members of our team were working hard on LinkedIn. Some of the contacts we approached thought we were looking for a date online; some asked us to review their app in return. One contact even asked me to introduce him to one of my important LinkedIn connections and I was happy to help, but most of them didn’t ask anything in return for filling out the survey. However I wanted my new LinkedIn friends to know that I’m ready to help if they need me to so I’d highlight this every time in the end of our conversation. The feedback we’ve received from the survey replies is PRICELESS. It let us get a clear picture of what our target market is, which product features are hot and most popular with our audience and which industry or company size is definitely not our focus. What I particularly like about this strategy, compared to posting to beta test websites, is the high percentage of relevant audience. The CEOs and company founders who are interested in testing out our app are far more valuable than paid beta testers with a low interest in your product. Moreover, I consider adding several thousands of CEOs to my LinkedIn network as a huge benefit, that will definitely help me with the future challenges. The puzzle pieces are coming together. We’ve learnt a lot about our target audience and also developed a working mechanism for receiving beta testers. Next time we’ll share our experience with the “beta” websites and give you an idea which platform worked best and brought us more testers. Tip: make it a task for all of your employees to devote some time per day (say an hour) to grow their LinkedIn network and invite new connections. You can divide your prospects by countries if you are going worldwide with your business or industries. E.g. 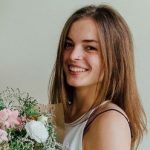 5 people of your marketing team can concentrate on 5 different geo locations to avoid inviting same connections by two or more employees. Don’t send the link to your website in the first message. LinkedIn might ban you for doing so. You can tell a person more about your product, invite to a beta test and if you feel he or she has a genuine interest and is hungry for more information – send link to your signup form in the next message. Don’t send the same messages to everyone. Customized messages and individual approach will help you build personal communication and trust which will result in higher chances for you to receive a beta tester. When you are inviting people to connect on LinkedIn do actually visit their profiles and then push the Invite button. LinkedIn doesn’t like you inviting everyone you see without even taking a look at their information. 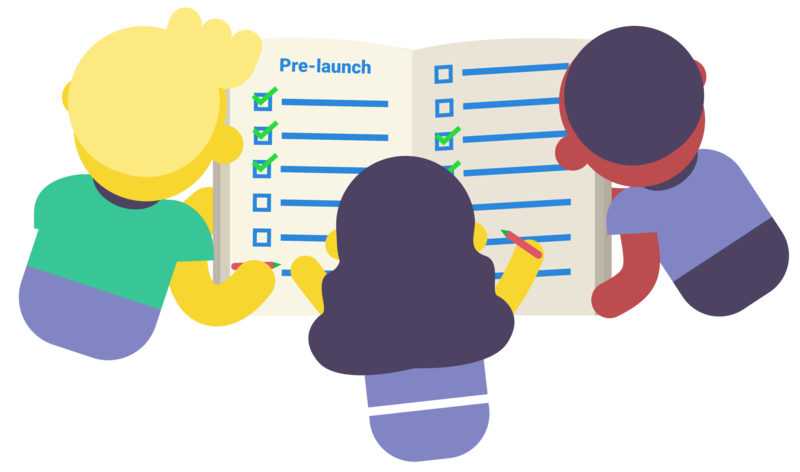 Hope this little tips will help you stay on a safe side while attracting a number of beta testers to your project. 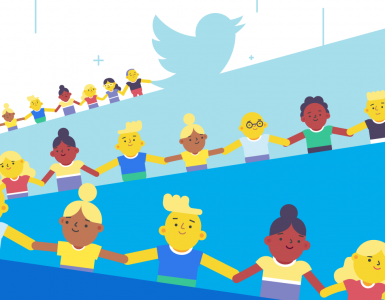 Feel free to share the lessons you’ve learnt while putting together your list of the early adopters. 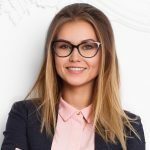 Olga Mykhoparkina is a Chief Marketing Officer at Chanty – a simple AI-powered team chat. This powerful and free Slack alternative is aimed to increase team productivity and improve communication at work. Having a 9-year experience in digital marketing field, Olga is responsible for Chanty’s online presence strategy, managing an amazing team of marketing experts and getting things done to change the way teams communicate and collaborate. Follow Olga on Twitter @olmykh or feel free to connect on LinkedIn. I am a little bit of concerned about how biased your incoming data from Linkedin would be. 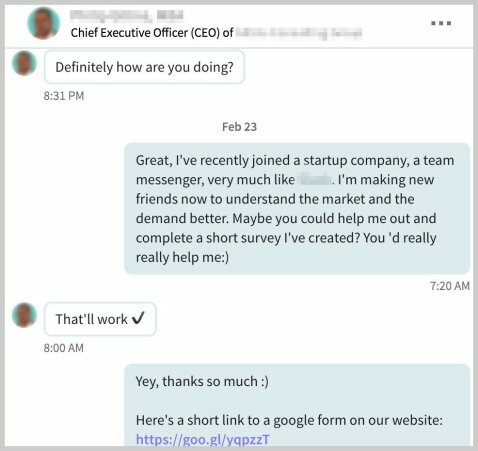 You are thinking that CEOs and Founders are in need of your Team Messenger due to their response in Linkedin Direct messaging. But the most engaged and responsive users of Linkedin are CEOs and Founders. So do you think that there is a pure correlation between them and the need of your product? I get your point. Of course, if you contact founders and CEOs on LinkedIn, you may find out some of them actually need the product, but mostly they don’t. This is why our conversion rates weren’t really that high. 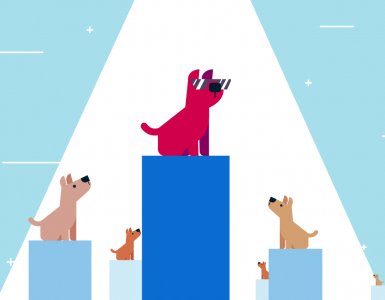 This is very similar to cold outreach, but it did its job – we got the 100 beta testers. Afterward, we’ve realized there are better ways to attract beta testers so we’ve stopped the LinkedIn campaign. However, this might be a good start for some startups who haven’t figured out their content strategy yet and can’t (or have no budget) to attract beta testers otherwise. What are other ways you tried apart from Linkedin and Beta tester websites? Hey Vana, these were our first steps. Then we started content marketing and it’s brought us thousands of early adopters. I should make a post on this one day 🙂 Cheers, Olga.